It's Teacher Appreciation Week, but today is actually Teacher Appreciation Day!! That is the day when children and their parents are encouraged to show their appreciation for their teachers. Our Teachers do so much for our children so it's time to show them just how much we care. It's easy to forget how much teachers do for our children each day. I can honestly say that my children have been blessed with some pretty awesome teachers. I am so thankful for that. Because of them my kids love school!! My little guy would much rather be at school them on any holiday break. That really makes me happy and I can thank his teacher for that. Don't you think it is time for us to show our teachers just how grateful we are for all that they do? It doesn't have to be much. In all the years my kids have attended school I have found that a homemade gift means so much. It can be a special card, flowers, a basket of apples, a yummy treat, breakfast, a home baked cake, pie or a craft made by your child. We usually make a variety of homemade treats and include something crafty. 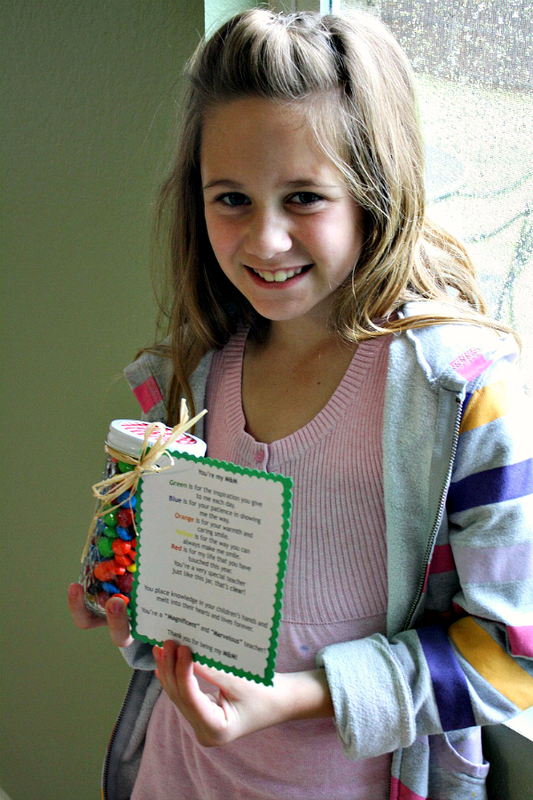 This year was no different......... We made Candy Jars filled with M&M's and a poem attached. "You're My M&M". Which represents You’re a “Magnificent” and “Marvelous” teacher! I love this poem and this gift only pennies to put together. I always have canning jars, ribbon and fabric on hand, so all we had to do was purchase some M & M candy. We chose plain and the new pretzel ones. We printed out the poems and the kids cut out and glued them onto construction paper using scalloped scissors. I have included the poem below. You’re a “Magnificent” and “Marvelous” teacher! Thank you for being my M&M! Isn't that the sweetest poem. If you would like to make one of these cute little candy jars, I have included some easy step-by-step photos and directions below. Start by tracing a circle using the jar ring onto your fabric. Cut out the circle and set aside. 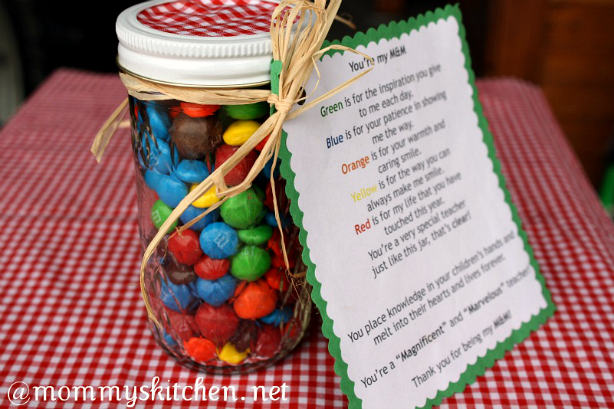 Have the children fill up the jars with M&M candies. Place the lid on and then the your fabric circle that u cut out. Twist on the rings and attach a ribbon or twine around the jar. There are 3 days left for Teacher Appreciation Week so there is still plenty of time to make this cute gift . Print off the poem, (printable version below) cut out and glue to construction paper. Punch a whole through the poem using a whole puncher. Run the ribbon or twine through your poem and tie into a bow. That's it you have a cute in expensive teacher gift that I just know they will love. Last year we made these cute little "Flower Pot Pens" pictured below. The teachers loved them and they look so cute sitting on their desks. These little flower pot pens also make great Mothers Day gifts. Just click on the flower pot pen link above for a step by step photo tutorial on how to make them. 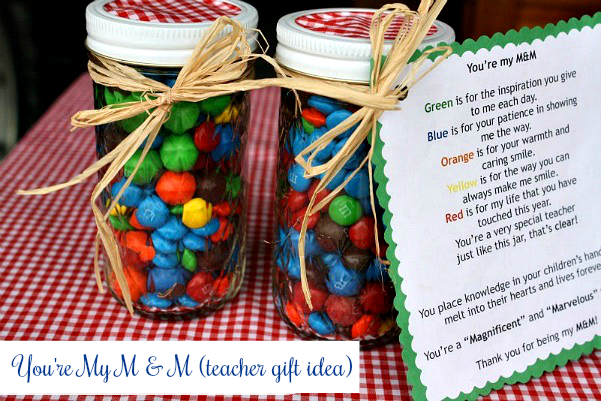 Another pretty teacher gift is a "Crayon Goodie Jar". This was such a fun craft to make. 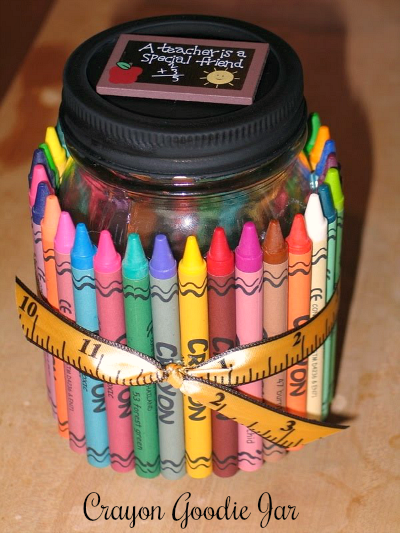 You hot glue crayons around a half pint size canning jar. Tie on a ribbon and spray paint the lid black to represent a chalkboard. Glue on a school themed decoration for the top and fill with something sweet. (M&M's, Skittles, Hershey's Kisses, granola, jelly beans or whatever you like). You can click on the link above for the Crayon Goodie Jar for directions located at the bottom of the page. Happy Teacher Appreciation Week to all our Teachers! Please know that we appreciate all that you do everyday not just today!!! Thanks for the great idea! I am going to make some of these for my son's teachers. It is teacher appreciation week at our school too and have been trying to decide what to do. Great ideas Tina, passed them along to my daughter...stay blessed! I love all of your creative ideas for teachers - they really do mean so much! I hope y'all are doing wonderfully out there, we certainly miss y'all over here! We miss you too Ms. B. Carson was so very lucky to have you as his teacher. I just asked him yesterday if he liked his new school? He said yes, but I love Shaw still. Thank you for playing such a big part of my little guys life. He thinks you hang the moon. I have to say "I agree". SO cute and creative!! Thanks for the amazing ideas! These are the best teacher gifts I have seen! These would be great for Christmas, birthday, or end of year. Thank you so much for such a great and easy on the wallet idea. Just ran up to Walmart. My sons teachers are getting these tomorrow. Thanks for the great idea! Robin you're correct these are great for Teacher gifts throughout the year. Your welcome Karen. I hope they love it. so they can put them together with the poem. watch over you. I just love your craft ideas. 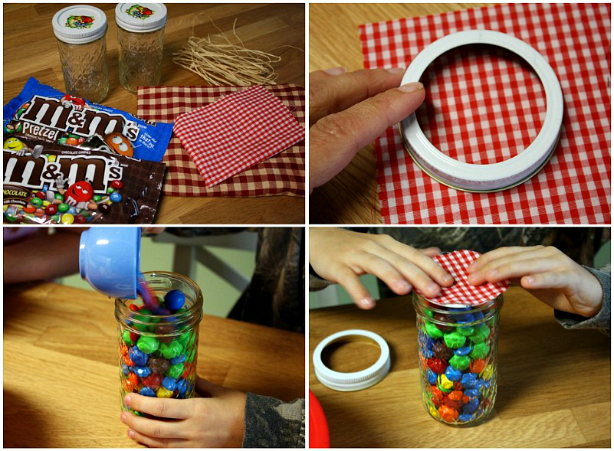 Where can I find that size mason jar for the M&M gift? Thank you. Any size jars will do. I usually use the half pint jars, but saw these taller jelly jars and grabbed them. You can find a assortment of jars at Walmart in the canning isle in housewares. Thank you so much for the great ideas. I've been thinking about some ideas for end of the year gifts for my son's teacher and these are fantastic! I'm thinking of doing the M&M jar and also the crayon jar. I'm thinking of filling the crayon jar with new crayons and maybe also doing a taller jar with colored pencils or markers. You've gotten my creative juices flowing! made my own labels with this poem (I changed it a little to add brown!) and added them to the bags of M& M's thanks for the great idea!